Coming to the Oriental Theatre for Five Weeks Only June 2 – July 5 before heading to Broadway, ON YOUR FEET! is a world premiere musical based on the life story of seven-time GRAMMY winning international superstar Gloria Estefan and her husband, legendary producer-musician-entrepreneur Emilio Estefan. Check out the first episode in ON YOUR FEET!’s new “The Journey to Broadway” series below to get a behind-the-scenes look at what it takes to bring this new musical to the Great White Way! Michael Urie, the award-winning actor from the hit show “Buyer & Cellar”, will be joining Broadway In Chicago for a LIVE Twitter chat on Wednesday, May 21! Want to know what he’s been getting up to while he’s in Chicago? What about how he prepares before going onstage? Ask him on Twitter using #BuyerCHI and he’ll respond to your questions in the hour he’s with us. We’re incredibly excited to have this talented actor chatting with us and we hope you will have lots of good questions about what it’s like to work in Barbra Streisand’s basement for him! Michael Urie spoke to Chicago Sun-Times theater critic Hedy Weiss last month about Barbra, her basement, Brooklyn and being alone onstage for 100 minutes. 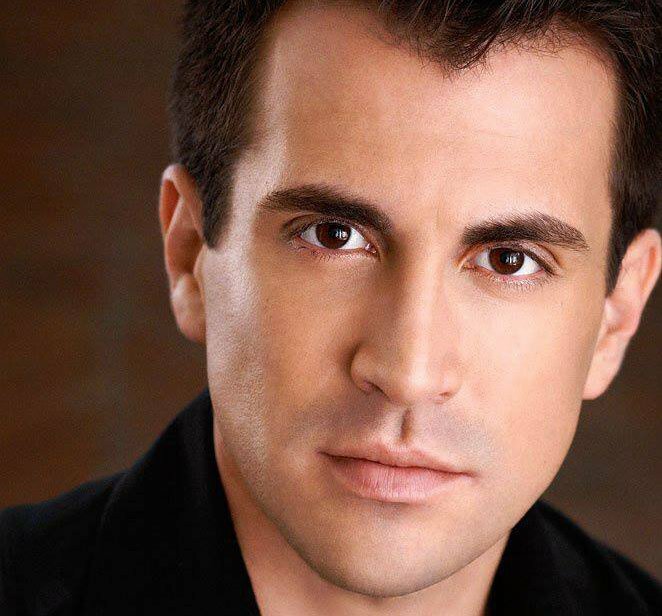 Guest Blog: Eric Ruiz Does It All in The Phantom of the Opera! Thank you to Broadway In Chicago and the beautiful state of Illinois for welcoming us to The Windy City, not to mention of course – our absolutely incredible audiences that have so generously spoiled us here. You guys are doing it RIGHT! To start with, people often ask which part I am in the show because they rarely get to see me in the roles of The Phantom or Raoul as I am an understudy. On a (mostly) daily basis I play a range of characters including the 2nd Porter (Auction), Soldier in Hannibal, Stagehand, a Box Guest in Il Muto, also a Fireman and various “Opera Populaire” company members in Act 2. As an understudy, I had the incredible pleasure of making my debut as The Phantom Of The Opera during the evening show on Wednesday, January 29th, here in Chicago. To say that the experience was beyond my wildest dreams would not do it justice! I had no idea that I wanted to be a performer until I saw this show (the #BrilliantOriginal on tour in Los Angeles) when I was 15 years old. Since then, it became a dream of mine just to be a part of this enduring and magical piece of classic musical theater, let alone to be able to play either the Phantom or Raoul. Getting to take the final bow as The Phantom in our #SpectacularNewPhantom was a full circle moment that went by so quickly; these are the moments to try to consciously see and feel everything so that the memory can’t escape. I don’t think I’ll ever forget that night, and the incredible audience, cast and crew that I got to share that with. Thank you. As for the city of Chicago – again, Chicago does it RIGHT! I’m not used to seeing very much open sky in many cities other than LA, especially New York City which is where I now live when I’m not on tour (AKA – everything is in storage). I love to eat, and Chicago is not lacking on the matter of choice and taste. So far, The Girl & The Goat has surpassed the expectations for many of us “traveling foodies…” We do LOVE to eat in this cast, and we love to eat very well, so we’re very excited for restaurant week too! Of course, Michigan Avenue is not to be missed for the range of shops (including grocery staple @TraderJoesList ), as well as the Avenues classic Chicago history. I love how much of nature is infused into the city. I’ve said it feels like New York City here, but less cramped, more space, and with more reverence to what was here before all of the buildings and people decided to set-up camp. It’s safe to say that since we work hard, we “relax hard” just as equally, and the Chuan Spa at The Langham, Chicago has been an oasis of privacy and serenity. I was able to meet William Wesley Myers, Director of Spa, who along with his staff have been more than accommodating and welcoming to the cast. Amazing massages and facials using world-class technique and ingredients, as well as a stunning health club and pool have helped to make Chicago feel as close to home as possible. I’m also looking forward to visiting the Shedd Aquarium, the Skydeck and “Ledge” at Willis Tower as well as Cloud Gate/”The Bean” in Millennium Park. I don’t know that I would have had the opportunity to visit Chicago were it not for being a part of this tour, and I have to say that it’s truly been one of the highlights since we left New York City back in the Fall. I’m looking forward to tweeting with as many of you as possible next Thursday, February 6th from 10:30am CST. Make sure and use hashtag #PhantomBIC so that our moderators can find your “tweet questions” during our session. Thanks so much for taking the time to read the blog and thank you again, Chicago -all of you- for your (much needed, brrrrrr!!) warmth and hospitality. Hope to see you at The Cadillac Palace through March 2nd! You can catch Eric in The Phantom of the Opera playing at the Cadillac Palace Theatre through March 2nd. Be sure to ask any questions for Eric (Porter/Ensemble) @theEricMRuiz, Nick Cartell (Ensemble) @nickcartell and Hannah Florence (Meg Giry) @YesHannahBanana for our Twitter chat using #PhantomBIC to receive a reply during the LIVE TWITTER CHAT! 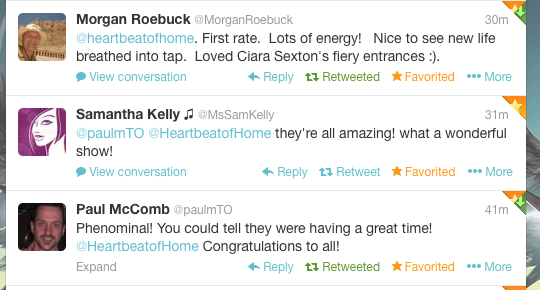 You can see more from Toronto audiences on the official Heartbeat of Home blog.